Furthermore Rewards High Production Values with the Alice Award By Michele Filgate Michele Filgate is an essayist, critic, and freelance writer. She is a contributing editor at Literary Hub and VP/Awards for the National Book Critics Circle. Her work has appeared in Slice, The Paris Review Daily, Tin House, The Rumpus, Salon, and other publications. 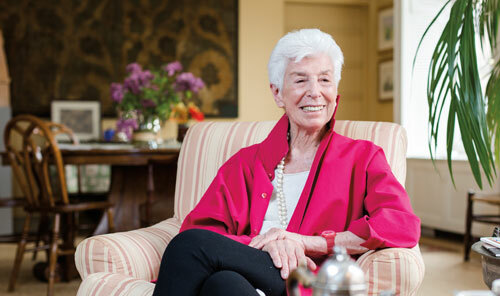 Joan K. Davidson grew up with an appreciation for the arts. Her mother, Alice Manheim Kaplan, served on many boards and was president of the American Federation of the Arts for ten years. Her father, J. M. Kaplan, started the J. M. Kaplan Fund, a New York City�based philanthropic foundation. Davidson took over for her father in 1977, and served as the commissioner of the New York State Office of Parks, Recreation, and Historic Preservation. In the mid-1990s, she established Furthermore, “one of very few philanthropic programs that specifically support printed and illustrated books,” according to the web site. Furthermore has distributed 1,075 grants over the past twenty years, ranging up to $15,000. Then, three years ago, Davidson, who is 88, launched a new program named after her mother. Candidates for the Alice Award, which celebrates the book as a work of art, are selected from Furthermore grant recipients by a panel of esteemed jurors. The winning nonprofit institution receives $25,000. The very first Alice Award went to the Brooklyn Museum for Youth and Beauty: Art of the American Twenties, and last year, the Whitney Museum of American Art received the honor for Hopper Drawing. This year, the winner will be announced the week of October 15 and then f�ted at the Frick Collection in New York City on October 27. The shortlist includes: Coney Island Visions of an American Dreamland, 1861�2008 (Wadsworth Atheneum Museum of Art in Hartford, Connecticut); Diego Rivera and Frida Kahlo in Detroit (Detroit Institute of Arts in Detroit, Michigan); The Open Road (Aperture, New York City); One Hundred Books Famous in Children’s Literature (Grolier Club, New York City); and A Portrait of Britain (National Portrait Gallery, London). The jurors include Michael Bierut of Pentagram, Paula Cooper of the Paula Cooper Gallery, the artist Maira Kalman, Gianfranco Monacelli of the Monacelli Press, and Jock Reynolds, director of the Yale University Art Gallery. For Davidson, it’s important to look at the book as a whole. Davidson said she understands the value of the e-book in the digital age, but she also appreciates the book as a physical object. Michele Filgate is an essayist, critic, and freelance writer. She is a contributing editor at Literary Hub and VP/Awards for the National Book Critics Circle. Her work has appeared in Slice, The Paris Review Daily, Tin House, The Rumpus, Salon, and other publications.